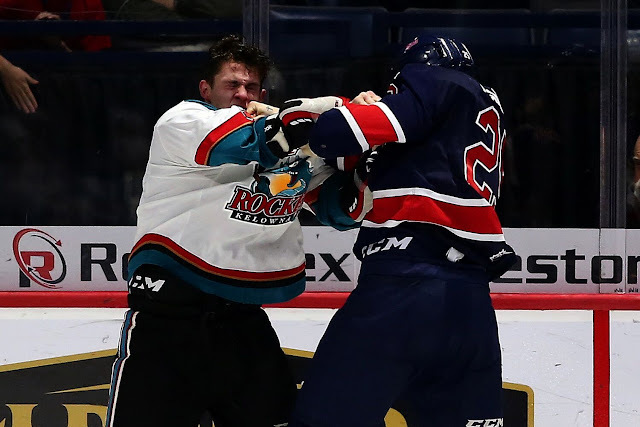 Regina – The Regina Pats fell 7-5 at home to the Kelowna Rockets on Teddy Bear Toss night at the Brandt Centre on Friday. Regina led 4-3 after the first period thanks to a pair of goals from both Josh Mahura and Nick Henry. Mahura scored the teddy bear goal four minutes into the game. The Rockets responded with two in the second and two more in the third to take a 7-4 lead. Mahura would complete his hattrick on the powerplay with his 11th of the year in the final minute but the Pats went on to fall 7-5 on home ice. Regina outshot Kelowna 37-32, the powerplay was 2/4 and the penalty kill was 1/1. Mahura led the offence with four points, Matt Bradley had three while Sam Steel and Nick Henry put up two. Tyler Brown made 19 saves in just over two periods of work, Max Paddock came in and stopped six of seven. - Josh Mahura picked up his first career hattrick in the loss. - Nick Henry scored twice and has three goals and six assist in his last five games. - Jake Leschyshyn has points in four straight (2G, 2A). The Pats (15-14-2) are right back at it on Saturday night against the Medicine Hat Tigers. Puck drops at 7 p.m. at the Brandt Centre. Tickets are available at reginapats.com, the Brandt Centre Box office and at all Regina Safeway locations, Safeway Funzone tickets are just $13 plus tax. Remembering first and foremost that these are teenagers, and that junior hockey is not professional hockey, and yet it is nonetheless very good, entertainment, I loathe to pile on or criticize one player but it would seem, once again, as if Brown must have let in one or more that he should have stopped and/or did not make a big save when the team needed it to prevent a momentum change. Whether it is his confidence or something else, which could include a weaker D in front of him, Regina had better be on the look for another goalie. And by the way, Medicine Hat was in Brandon tonight. Great game which the Wheat Kings won in OT. Sorry, but I would have to say that even if the Pats have Steel and Bradley as well as Mahura as high end players, overall, the Tigers look better than Regina at this point in the season. So does Moose Jaw and Swift as well as Brandon for that matter. There is then Portland out west who is doing well, and Kelowna demonstrated they are decent. I doubt that the problem stems largely from the coaching, as Paddock has not forgot what to do. Having a championship calibre team a year early, a lack of depth, and average goaltending has made the Pats mediocre. Do they have enough in the cupboard to make a bigger trade, and even if so, do you take one for the team insofar as the roster of rookies or draft choices in order to build a competitive team for May, when they likely will not win anyways? Slobo has 1 assist since November 3rd. One assist in a month on the second line from a 20 year old and our 20 year old goalie well. Looks like the Teddy Bears got "Tossed" tonight alright. Kelowna is much stronger than anticipated and it showed just that tonight. Regina seems to be getting weaker at almost every outing except for the "Weaker" teams and when a couple of their 'Key" players go to the Worlds thing will probably just get worse. Paddock came away with an even clearer view of how his team should be constructed for the 2018 Memorial Cup in Regina. “It affirmed what I already had been thinking for a while,” said Paddock. “It’s an older tournament and it’s an older team that’s needed to play in it. I knew that but, just watching, that was affirmed. Riley Woods, who was traded for Slobosian, 11 Goals 14 Assists 25 points. Josh Mahura scored three goals but in the end it didn't mean anything because it was yet another loss for the Pats. He can't do it all. Last night Sutter in Red Deer traded Zablocki to Lethbridge for Tarzwell, a dynamic 17 year old, a second round pick and a third round pick. Now if you add that to the three first rounders we gave up in the "trade" from last year that's one hell of a haul for Mahura. Little wonder Paddock can't make any trades. His cupboards are nearly bare. The Pats have no dynamic 17 year olds that anybody would want and it takes players and draft picks to make deals. We have a few picks well into next decade to use but little else…………the goaltending regardless of the name is putrid plain and simple. It has been most of this year and a lot of last year. Only difference last year we masked the problem by scoring 353 goals. In the end it still wasn't good enough. You could see the life being sucked out of the team last night with each weak one that went in. That was a winnable game but it goes down as a bad 7-5 loss. Not upgrading isn't an option if the team a) wants to make a playoff spot b) the doesn't want to embarrass itself at the Memorial Cup, yet Paddock may have tied his hands so badly with his previous trades that he can't do much……we were told we would have a good club with veteran players and that hasn't happened. Our defence is too soft and poorly coached. Our speed and skill is poor. Our depth is non existent. Our big prize centre is being forced to play left wing for Steel so as to get him going meanwhile hurting out centre depth was was desired and traded for. Instead of Paddock getting a left winger for that line he weakens himself at centre. A 17 year old rookie is our third line centre???. Playing two rookie d-men each night.??? Having veteran d-men #55 look like a blue pylon. This teams construction is sad and it's all on Paddock. Waiting too long drinking the Jost and Wagner kool-aid………If I was paddock I would stay away from dealing with Sutter. Lethbridge obviously thinks they can make noise in the Central Division, they won't be trading. There are obviously fewer and fewer teams to deal with and the prices get higher the longer you wait. The Pats have probably waited too long while management was dreaming……In all reality they should be sellers because they are not elite in any way…..we didn't get what was promised. After all it's about the hockey. That was a stinker for sure and turned ugly with the fights at the end. Like JP said where was that spirit earlier in the game? Heard Jake Bean was a healthy scratch last night - interesting? Pats need to move opposing forwards from in front of net - another 3 deflections last night and the shorthanded tally by Dube was a killer. Interesting that a lot of you are complaining that Paddock is "wasting" a 20 year old spot on a goalie so did a bit of research. Surprise surprise - Broncos, Wheat Kings and Winterhawks have 20 year old goalies so I guess their coaches are crazy as well. There may be other teams with 20 year old goalies too but didn't look at all the WHL Teams. Now you guys can counter that with "Well those teams are having great years so those goalies must be so so much better than Brown/Paddock, and that's why there are "wasting" a 20 year old roster spot". Goals Against Average stats - other than Kehler, Brown's GAA is basically the same as the other 2 20 year olds, and compared to Kehler, Brown lets in less than 1 goal a game more than him. Not too shabby. Save % - again Kehler leads all of them but all stats are very close when you talk actual numbers. Compared to Brown, Kehler makes only 38 more saves in 1000 shots. Holy Rod. These last 3 posts are from non hockey guys who are analyzing the game. Kinda sad... how these people know everything again. Mahura was a 2 year player... so that trade was fine considering what lethbridge gave up for zablocki. Yes our 20s are awful. But so is the pregame video. It's definitely s down grade from last year. It used to be exciting watching that kid skate on wascana lake. Now u got someone talking and u can't even understand the words or some poor highlights. Regardless our team is 4 players away from being really good. Really good. Given that JP can work some deals (if other Teams are willing to deal) to bolster the offensive and defensive core . Come on Weppler, by the time JP as you call him can make things happen it will be far to late and probably is now, because most of the big deals are already happening. Pats will go no where in the Memorial Cup and you should know this with all your "Statistical Information" !. Heard that Moose Jaw is after Bean also so it isn't a given the pats might end up with him, who is willing to give up the most. Not sure what Moose Jaw hasin there coffers but with Woo injured they are looking for d-men. The Pats are competative with the Blades and not upper echelon teams. The only difference is that the Blades won't be embarrassing themselves at the memorial cup. Maybe videos from 1974 can be shown during the Eagles concert. The Pats are in the Memorial Cup no matter what type of team they field. They have wasted two 20 year old spots on Brown & Slobosian. I would be a seller. Let the auctions begin for Sam Steel & Josh Mahura and set yourself up to be a top team for years to come. All the CHL is interested in is profit, not whether the host team is good enough to win it all. The Pats have fulfilled their obligations. Highlight of the night with next to no time left on clock is Mahovolich humiliating Adam Foote's kid #29 with a shot to the temple and then 3 quick upper cuts as he was half concussed. Pats in dire straights with Mahura and Steel going to Canada's Jr team until middle of January. I don’t know enough about hockey to comment on any one individual or the offence, defence of penalty kill. What I would like to comment on is the overall feeling as a Pats fan and the aura surrounding the Regina Pats. It feels like last years very competitive team seems to have been an anomaly and not the beginning of better things to come. Which is what we were all informed to believe. It made sense at the time. Even now it makes sense so what the H & E double hockey sticks is going on? It’s certainly not the Media’s fault for preaching good things are now upon us last tear. Everyone in the junior hockey world in North America felt the Pats probably had a solid and competitive team for a few years to come. Sadly one year removed from a very good team and we are right back to where we have been for soooo long. I think there is a Regina Pats picture in the Webster Dictonary. When you look up the word “mediocrity” there it is. Am I out of line by saying this. Through my frustration am I embellishing. I don’t think so. Quite frankly I’m shocked that John Paddock hasn’t figured it out and made the necessary trades and so on. One person at work stated that John has traded away so much. That non of the players feel like they are part of a team. That they are just biding their time until John pulls the plug on them and away they go. Does that sound logical or again maybe it’s just grasping at anything to explain what’s sadly happening.